18 March 2019, Singapore - Race promoter Singapore GP Pte Ltd will host the inaugural Race Officials' Recruitment Open House as part of a drive to recruit volunteers for the Formula 1 Singapore Airlines Singapore Grand Prix 2019. Members of the public who are keen to experience the excitement of being part of an award-winning team overseeing the Formula 1 night race are invited to visit the Open House on Saturday, 23 March at the F1 Pit Building from 11am to 3pm. Visitors to the Open House can immerse themselves in an engaging array of stations that aim to simulate the on-ground scenarios typically faced by race officials in areas such as Flag Signals, Track Craft and Emergency Response (see Annex A for full description of the stations). They will also have the unique opportunity to visit the nerve centre of race operations in the Race Control Experience. Those who complete an experience card at all stations at the Open House can also stand a chance to win a pair of three-day Zone 4 Walkabout tickets for this year's race in a special lucky draw. Critical to the success of every Formula 1 Singapore Grand Prix since the inaugural one held in 2008, volunteer officials are assigned to oversee various aspects of the race. The team's hard work and commitment was recognised last year, when it edged out other teams from around world to be awarded 'Best Team of Officials of the 2018 Season' by the Federation Internationale de l'Automobile (FIA), the governing body of motorsport (see Annex B for details of the FIA award). 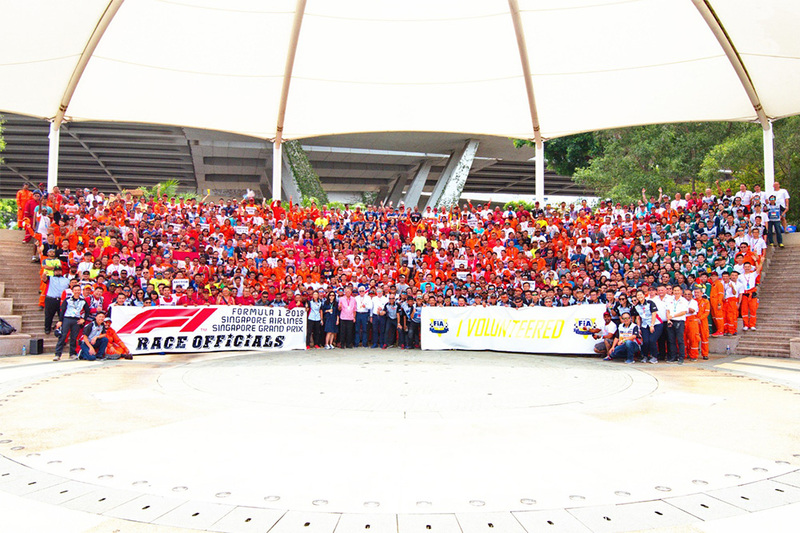 This year, 250 volunteer positions are available in key trackside functions including fire marshals, medical team, observers, track marshals and flag marshals (see Annex C for Roles and Responsibilities of Singapore GP Race Officials). First-time race officials will attend approximately three to four days of theory and practical training, conducted over weekends starting April 2019. Key highlights of the training include performing recovery and extrication exercises on a Formula BMW open-wheeler and a Subaru WRX. Senior officials will also undergo specialist hands-on training in fire safety and track recovery. Depending on the area of responsibility, each marshal can expect to clock a minimum of 24 hours of training. Members of the public interested to volunteer as a marshal will need to be 18 years and above, be physically fit, and should preferably have a passion for motorsports. Volunteers will also need to commit to all scheduled training sessions and be available to participate in the event from 19 to 22 September. Applications must be submitted via http://raceofficials.singaporegp.sg by 1 April (12pm, Singapore time).